(Bloomberg) -- Speaking in a hauntingly calm tone, he confessed to treason -- trying to overthrow Venezuelan President Nicolas Maduro. The Colombians, he said, granted him free exit and entry; the Central Intelligence Agency met with him. Oswaldo Garcia Palomo, a fugitive retired Venezuelan National Guard colonel who had called publicly for a coup, slipped back across the border in late January to foment revolt. But as Information Minister Jorge Rodriguez noted last week when he played the confession for reporters, Garcia was monitored the minute he arrived. This wasn’t the image that the opposition has sought to project. Since Juan Guaido declared himself interim president three weeks ago and offered amnesty to officers who abandon Maduro, more than 30 countries led by the U.S. have hailed the move, waiting for the military to follow. There hasn’t been a rush to his side. In a country with more than 2,000 generals and admirals, only one top officer -- who commands no troops -- has pledged allegiance to Guaido. So have two colonels (a physician and a military attache in Washington). 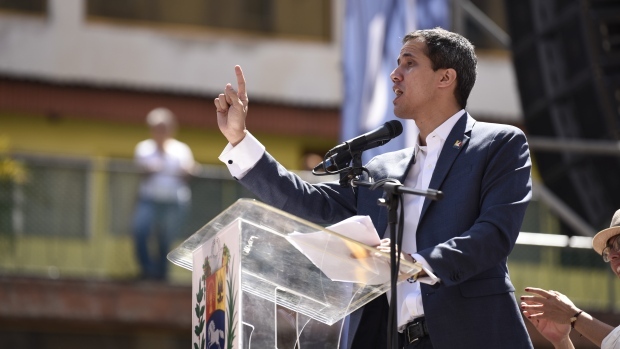 Guaido has said that he has privately been in touch with other officers and that more will follow. He doubtless is, and perhaps they will. Still, Garcia’s capture and confession show how tough a task Guaido faces. The plan to get rid of Maduro involves more than diplomacy. An oil embargo starving the state of its main income seems likely to have an impact soon, even on some of the ruling elite. Guaido is expected soon to win control of Citgo Petroleum, the U.S.-based refining unit of state oil company PDVSA, which could prove to be a major resource. There is also a multinational aid operation underway that could cause further disruption. And rank-and-file national guardsmen have been abandoning the force. U.S. National Security Adviser John Bolton recently offered to remove sanctions against military chiefs who join Guaido. Senator Marco Rubio of Florida repeated the offer, saying that if any of the top six military leaders defect, the U.S. will guarantee their immunity. Longtime observers, however, say the generals doubt the promises will be kept. The revolution isn’t moving as many had hoped when Guaido electrified the world on Jan. 23 with his declaration. This has led to impatience and finger-pointing. U.S. policy makers and those around Guaido -- as well as leaders in Brazil and Colombia -- are eyeing one another and worrying about failure. Officials in each camp have said privately they assumed the others had a more developed strategy. The plan to deliver humanitarian aid to help the hungry and challenge the Maduro government is stalled. The conviction that an oil embargo will force the leadership’s hand is challenged by other sources of income. Russia and China remain allies and oil clients. Venezuela says it will double its crude exports to India. And hundreds of millions of dollars in illegal drug money makes its way into the bank accounts of the country’s leaders, according to the U.S. The Drug Enforcement Administration recently estimated that 15 to 20 tons of cocaine still move from Venezuela to the U.S. each month, according to a person who works with the agency and asked not to be identified. Much of the illicit traffic is controlled by Venezuelan military officers and government officials, according to U.S. officials, meaning their countrymen may suffer but many of them won’t. A DEA spokeswoman declined to offer more specifics. Maduro has dismissed the U.S. allegations as absurd. Worry about what comes next has intensified. At a meeting in the U.S. embassy in Bogota, Colombia, last week, military, intelligence and civilian leaders from both countries discussed ways of moving humanitarian aid into Venezuela. There was a sense of frustration in the air, according to a participant who agreed to discuss it on condition of anonymity. The U.S. said it was paying for the aid but wanted Colombia to find trucks and drivers to move it in. The Colombians said no one would accept the mission because the Venezuelan military would arrest them. The aid remains in warehouses near the border. At similar meetings in the Colombian border city of Cucuta, a person who attended said the dynamic was the same -- the U.S. expecting Colombia to find the means to deliver the aid and the Colombians saying they can’t. On Tuesday, at well-attended anti-government demonstrations, the opposition announced plans to organize caravans of Venezuelans bringing the aid from the border and setting up a possible confrontation with security forces. This would amount to a damning and politically useful photo opportunity. But the region is thinly populated and, given gasoline and transportation shortages, it isn’t clear how to move other Venezuelans to the area. One of the high points of recent events for the opposition, long divided, is the way that it has united behind Guaido in an effort to depose Maduro and hold free elections. But the longer things stall, the likelier that some will break ranks. Others say Guaido made his amnesty offer without proper preparation. In fact, the National Assembly hasn’t even yet formally passed the measure. Antonio Guevara, a retired colonel living in exile, also said nothing has happened to generate a fracture in the armed forces. “The high military command remains united, and cracks haven’t yet turned into fractures that could generate destabilization,” he said. He added that in previous uprisings the key to action lay in the hands of mid-level commanders who oversee troops. So far there is no evidence that they are budging. --With assistance from Matthew Bristow.